Antique oak chair, Victorian heavily carved barley twist throne chair, antique armchair, Scotland 1880s Scotland 1880s Carved oak top rail Back profusely carved Upholstered leather back with thick barley twist supports Arm rests are upholstered in leather and have carved lion heads on the front Large leather upholstered seat Ending on solid oak legs which are united by barley twist stretchers Fabulous quality in excellent condition All joints are tights. $1150 B1333 Measures: 26" x W 27" D x 51" H (Seat 17" H). Vintage barley twist oak chair recently upholstered in coral cotton velvet. 19th century barley twist/ turned wood armchair on casters. Newly upholstered in off-white Belgian linen. 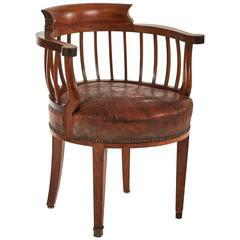 1880s England round wood and leather cushion desk armchair. Solid oak twisted column feet and lion' heads Louis XIII style armchair with turning system Seat originaly canned and working perfectly, all in excellent condition, circa 1880.